Lanark: A Life in Three Acts, Citizens’ Theatre, Glasgow (2015). Photo by Tim Morozzo. The publication in 1981 of Alasdair Gray’s Lanark: A Life in Four Books constituted a landmark in modern Scottish fiction. Sometimes described as Scotland’s Ulysses, the novel is striking for its combination of postmodernism and magic realism and for the scope of its imagination regarding both form and content. Moreover, published just two years after the failed Devolution Bill,1 Lanark answered a cultural need: it played a key role in reimagining Scotland, and especially Glasgow. Famous for its first-edition title-page quotation suggesting that readers “work as if you were living in the early days of a better nation” and for declaring that cities really only begin to exist once artists have made use of them (as Gray makes use of Glasgow in his novel),2 Lanark helped to bring into being the city and the culture where Gray and other artists could find a place and to greatly expand the range of perspectives through which Glasgow, and by extension Scotland, could be viewed. In the thirty-four years since its first publication, the ideas, politics and ambition of Gray’s novel have influenced a generation of writers and other artists in Scotland and beyond. It thus seems particularly fitting that a year on from the most recent Scottish Independence Referendum, David Greig, Scotland’s leading contemporary playwright, has returned to and celebrated Gray’s postmodern masterpiece in a new stage adaptation, Lanark: A Life in Three Acts. 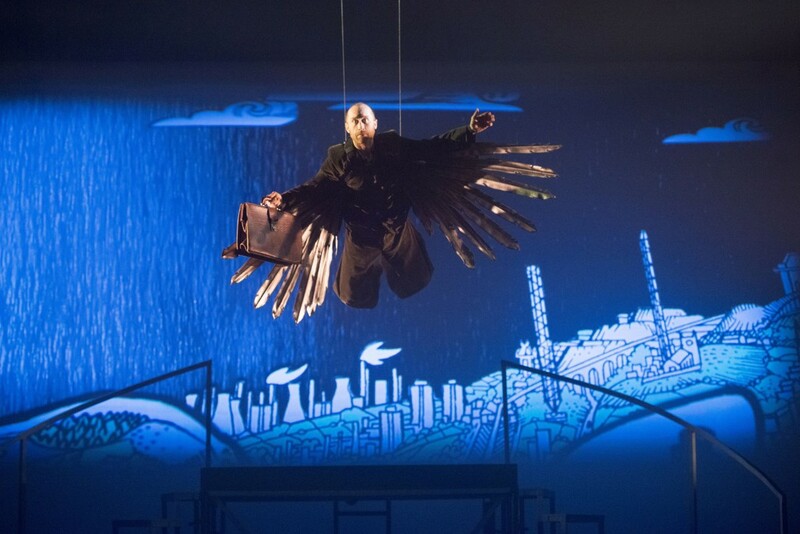 This theatrical reimagining of Gray’s novel, written by Greig and directed by Graham Eatough, was brought to the 2015 Edinburgh Festival stage in a co-production between the Citizens’ Theatre and the Edinburgh International Festival (EIF). Previews took place at the Citizens’ Theatre from 15th-17th August,3 with the production then premiering at the Royal Lyceum Theatre, Edinburgh on 22nd August and playing there until the end of the month, before returning to the Citizens’ Theatre for a further run from 3rd to 19th September. The production celebrated the 80th birthday of Alasdair Gray and also the 70th anniversary of the Citizens’ Theatre. Lanark: A Life in Three Acts (hereafter Lanark) is also notable for reuniting the core artistic team of Suspect Culture (1993-2009) – the experimental theatre company founded by Greig, Eatough and composer Nick Powell after they met at Bristol University in the early 1990s and which went onto become one of the most significant companies of the 1990s and the early 2000s with defining works such as One Way Street (1995), Airport (1996/7), Timeless (1997) and Mainstream (1999). While there have been previous adaptations of Lanark: A Life in Four Books – in 1995 TAG Theatre Company brought to the Edinburgh Festival stage an adaptation written by Alastair Cording and directed by Tony Graham and, more recently, there has also been a BBC Radio 4 adaptation by Robin Brooks – Gray’s novel is nevertheless often considered to be defiantly resistant to adaptation and near-impossible to stage due to its sheer size and narrative complexity. The novel, which took Gray approximately twenty-seven years to write, is nearly 600 pages in length. Its narrative is split between the semi-autobiographical and relatively naturalistic story of Duncan Thaw, an art-school student who is trying to find a place for himself and his work in a post-war Glasgow, and the dystopian story of Lanark, a character who has no memory of his past and so takes his name from a train ticket and who finds himself in the sunless and dying city of Unthank. Unthank is a future Glasgow where the citizenry is afflicted by an epidemic of different illnesses, including some people’s bodies becoming covered in mouths and other people’s slow transformation into dragons. This is a world in which it is possible to travel through a series of parallel universes via the Intercalendrical Zone. 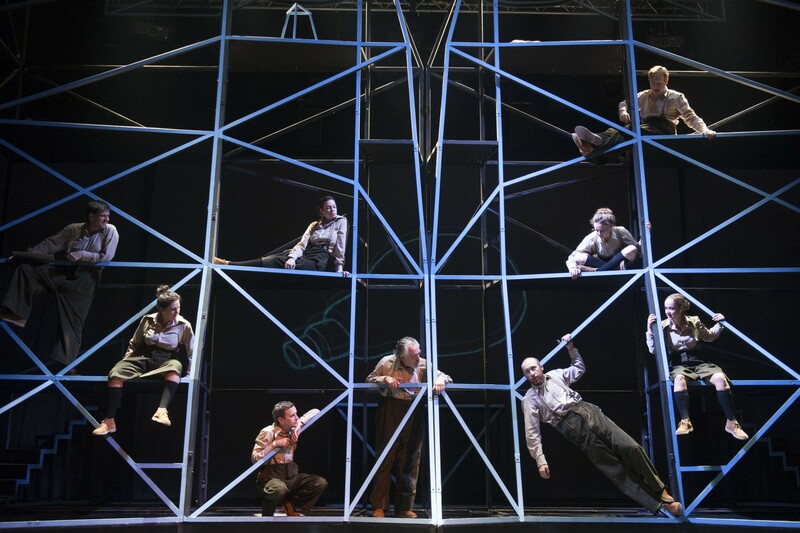 With its complex combination, then, of a more naturalistic narrative exploring twentieth-century Scottish working-class life and a fantasy narrative featuring science-fiction elements, bringing this epic novel to the stage is an ambitious undertaking. Greig and Eatough present their version of Lanark as a “Life in Three Acts”, beginning and ending with Lanark’s progress through dystopia, and distilling the Duncan Thaw story into a single central act. The acts are arranged in the order of two, one and three, thereby capturing the playful approach Gray has in the source text to the numbering of the different books.7 Thus the play begins not at the chronological beginning of the narrative but with Lanark (played by Sandy Grierson) arriving in Unthank and being introduced at the Elite Café to Rima (Jessica Hardwick) with whom he falls in love. Later he finds himself in the Institute, a medical facility where he is treated for dragonhide and where those who do not recover are turned into processed meat. Upon becoming cured, he himself becomes a doctor responsible for treating a dragon he strongly suspects to be Rima. The middle act, or ‘Act One: A Portrait of the Artist as a Young Glaswegian’, recounts Lanark’s previous life as Thaw (Grierson) as he struggles to find his place as an artist and to find love. In Act Three, Lanark and Rima flee the Institute by travelling through the Intercalendrical Zone and when they arrive back in Unthank Lanark learns that he must travel to a place called Provan to represent the city at a global conference and save it from destruction. In contrast to Acts Two and Three, the middle act is an ensemble piece in which the Oracle recounts Thaw’s life story. It is treated in a more self-consciously dramatic, almost expressionistic style, with an ensemble of nine actors all dressed like Thaw and becoming, as it were, multiple Thaws, narrating his past and playing key characters from his life-story. The use of projections is greatly scaled back in Act One and here the actors create the soundscape through song and voice and also through physical actions, such as gently knocking the metal scaffolding-type structure that comprises Laura Hopkins’ set to create the effect of the distant noise of a steelworks factory. In this act, the emphasis is on story-telling. Through the use of a sophisticated combination of technology, music, gesture and text, Greig and Eatough attempt to find a theatrical vocabulary to represent on stage the experience of reading Gray’s novel – that is, to represent on stage the relationship that Gray creates with his readers through his playful storytelling. Perhaps the moment in the production that best captures this playfulness occurs in Act 3 when Lanark steps out of the play so that he can petition the writer for a different ending to his story. In response to Lanark’s demand to speak to the writer, a huge pair of glasses appears from above and the audience is invited into Gray’s head. Projected onto the lenses of the glasses is a cartoonish video animation of Grierson as Lanark, as he explains to Mr. Gray that there ought to have been more love in his life. It is in this scene that Greig and Eatough play most explicitly with the shifting layers of fiction found in the source text. Bold and imaginative from start to finish, this production achieves its goal of conveying a sense of the wild imagination of Gray’s novel and of Lanark and Rima’s journey through space, time and consciousness. 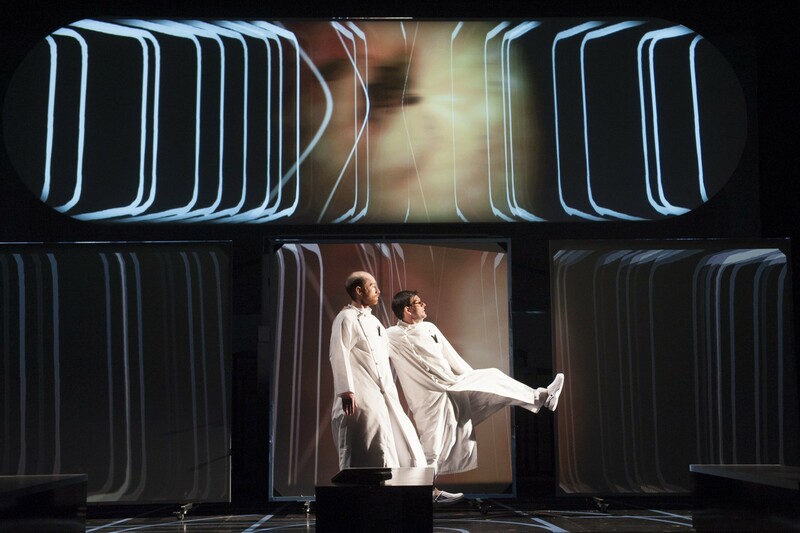 Through their experimental dramaturgy Greig and Eatough have found a means of transposing onto the stage the formal experiments of Gray’s Lanark, as well as a space in which it is possible for their and Alasdair Grays’ voices to co-exist and inform each other. Moreover, with the cosmopolitanism of its enquiry, narrative and theatrical telling, Lanark: A Life in Three Acts brought to the international stage last summer not only a celebration of Alasdair Gray’s career as an artist and writer but also a post-Referendum celebration of a European postmodern identity for Scotland. * David Greig, Lanark: A Life in Three Acts (London: Faber and Faber, 2015), p. 190. Victoria E. Price is a lecturer in Theatre Studies at University of Glasgow. Her publications include articles on: Scottish theatre and drama; Shakespearean adaptations; and, Elizabethan and Jacobean drama. Her current research project is a book-length study of Scottish adaptations of Shakespeare. She is also on the Board of A Moment’s Peace Theatre Company.